I hope everyone had a beautiful weekend. I celebrated Easter with family and had a lovely time. This weekend was symbolic in that while I was celebrating the resurrection of Jesus Christ I was also celebrating some new beginnings and resurrections of my own. I have been experiencing a lot of change lately. I believe change is a good thing but at times it can seem overwhelming. Instead of looking at my personal path of changes as overwhelming, anxiety ridden or filled with sadness, I have been seeing them as a new chapter. Believing in a fresh start and a new beginning. The exciting part of a new chapter is you don’t know how the pages will be written…. 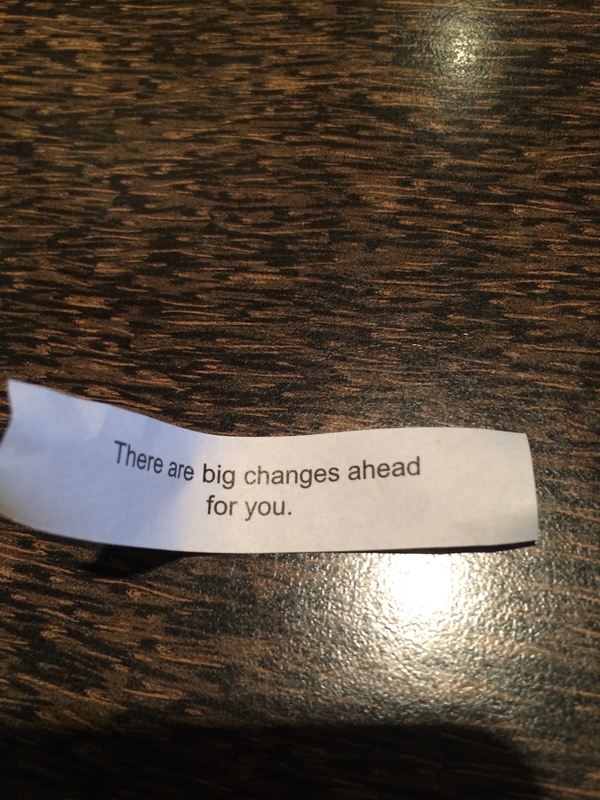 I should have known this was coming when 3 weeks ago this was what was inside my fortune cookie. Why I took a picture? I don’t know…Fascinating! I cannot wait to share the unfolding of the new chapter on this site! 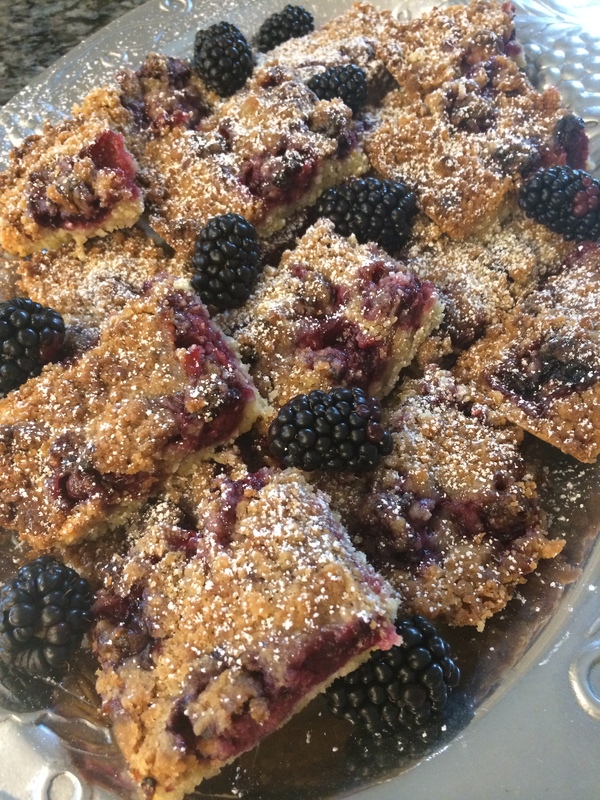 Onto the most delicious blackberry bars…. 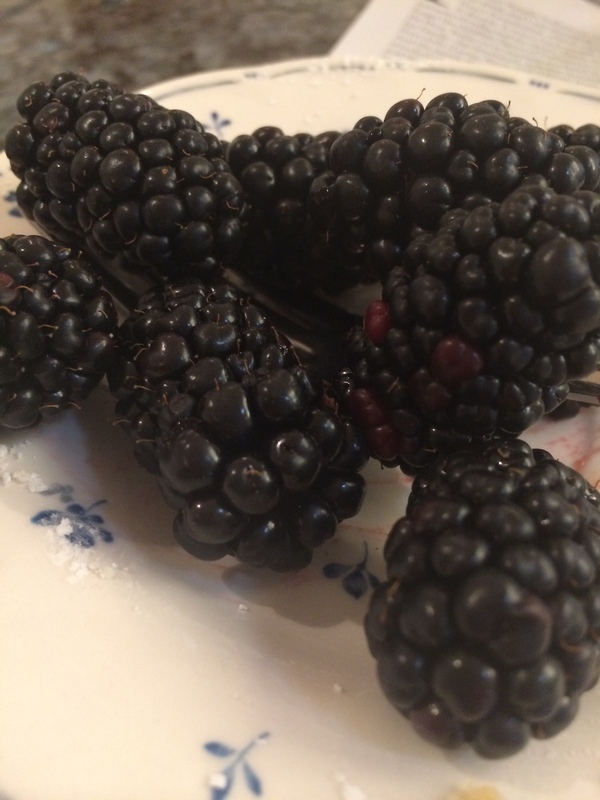 Go to the farmers market and find the most eye-catching, mouthwatering blackberries. Then zest an orange and bake these bars! Preheat the oven to 400 degrees F. Lightly butter a 13X9 inch baking pan. Combine Flour, sugar, orange zest, and salt in a bowl of a mixer or food processor. With the motor or paddle running add the butter a few chunks at a time. In a small cup, stir together the egg and vanilla. With the motor running gradually add the egg mixture. Process until the mixture pulls together. Add the cold water. Crumble the dough into the prepared greased pan to form the crust. With floured fingertips gently press dough into the baking pan into an even layer over the bottom. In a large bowl stir together the sugar, flour and nutmeg until combined. Add the blackberries and toss to coat. 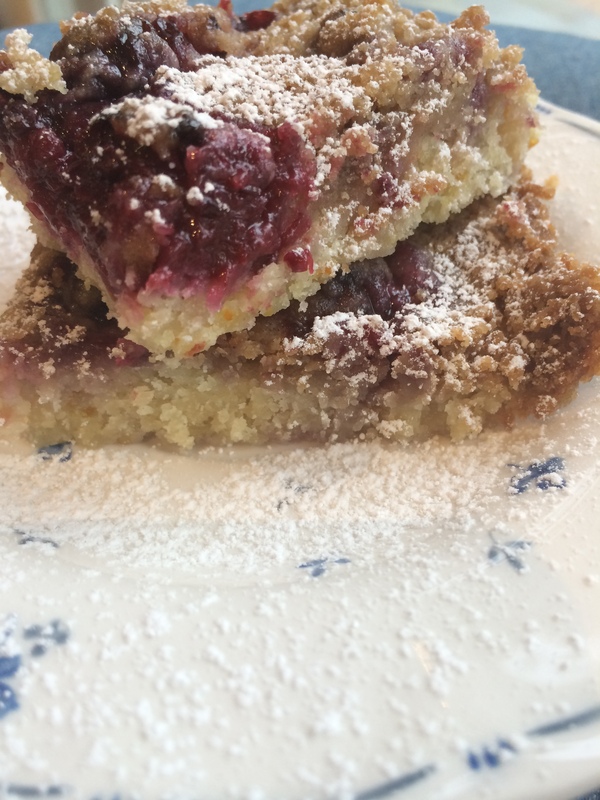 Spread the blackberry sugar layer evenly over the crust. Work the butter and sugar together with a wooden spoon until blended. Using a fork gradually add the flour, stirring until the mixture resembles course crumbs. Sprinkle the mixture evenly over the blackberries. Bake for 15 minutes at 400 degrees F. Then lower the oven temp to 350 degrees F and bake for an additional 30 minutes. Allow to cool. Cut into 18-24 bars. Remove from pan. To serve dust with confectioners sugar. Evelyn, I love that your step dad said that! See you soon can’t wait to catch up with you! Sounds like a wonderful Easter. Your mom was telling me about this. I can’t wait to try them. I’m so excited for you and what your future holds. Big changes=exciting things. Be confident in the plans God has for you. Seanne! Thank you so much! I hope you had a lovely Easter! Krista..so wonderful to see you this weekend! So excited for your new adventures! Love you tons! And loved your blackberry bars! Delicious! Change same word in French changement…. And I cannot wait to read you within the next weeks. Comme toujours merci pour la recette! Dear Krista , . May God be a lamp to your feet and sprinkle your path with wisdom, peace , joy, hope and reassurance as you pursue your wonderful new endeavors . The best is yet to be ! Blessings to you always ! What beautiful words. Blessings and love back to you! Hi Krista! Your Easter blog took me to a beautiful meditation. Very thoughtful and beautifully written. And I love the blackberry bars! Hello my friend! We must bake these together when I am in Sacramento. Nothing but great things are ahead of you. So proud to call you a friend!